Nothing rumbles like the metal mosh pit of a medieval scrap in full swing. 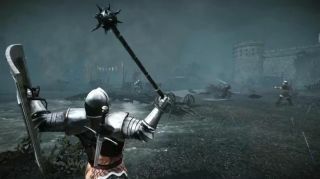 After a successful Kickstarter run , Torn Banner's Chivalry: Medieval Warfare expanded upon its origins as a Half-Life 2 mod into a standalone first-person multiplayer slasher with blood-soaked jerkins and jerks soaking in blood. Chivalry's latest trailer, comprised entirely of in-game footage, blasts the mayhem of battle into your eyeballs before revealing an October 16 release date. Have a look above, but we heartily recommend augmenting your viewing experience with the thrash-metal riff of your choice.